Its getting Unbearable Now ! Gujarat continued to reel under the continuing heat wave as its impact was felt by the common man. The heat wave claimed five lives in Gujarat while the northern belt continued to reel under intense hot conditions today with the mercury settling above the 46/47-degree mark at several places. Hundreds fell ill in Ahmedabad due to intense heat.The locals are having a tough time with temperatures soaring over 45c in city. Heat Wave is continue in entire Rajasthan.Tempreture is above 45/46c at most of the places in the states. "Yesterday, mercury crossed 49c at Phalodi in Jodhpur District." Unconfirmed report. Delhiites had to bear with scorching heat as the maximum hovers around at 44c, 4 notches above normal, while the minimum is around 30/31c degrees. A diagram showing the Above Normalcy of the last 1 month in some of the "Hot spots" in India. The South -West winds in the Arabian Sea seem to have tapered a bit. From my last report, when they were speeding at an ideal 30 knts, they seem to be below that now.The wind chart shows the maximum gusts in the Bay, and near the Somali coast. A little delay, again, for Kerala? After having advanced into Sri Lanka, and the extreme tip of India,( My assumption), it now seems the slight "pause" is taking effect. 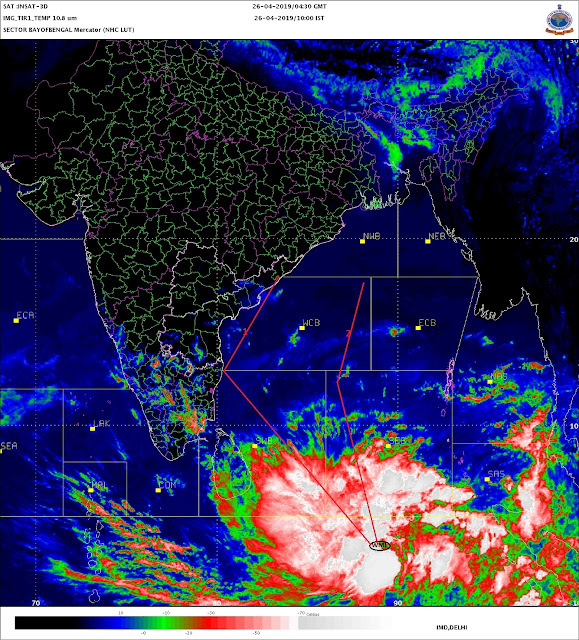 As on now, I see the Monsoon advancing into Karnataka coast by 1st June, and Goa south Konkan around 5th.June. The seasonal low over the desert regions is now at a core of 996 hpa. And is widening its base, what with the 49-51c range in Sindh and Rajasthan. Hottest in Asia: 51c in Nawabshah, Larkana and Jacobabad. Hottest in India: 48.2c in Kota, and 48.1c at Ganganagar. And now,the real hot stuff ! Hottest Night: 34.4c(+8c) in Jaipur and 33.5c in Ajmer. No rain expected till Sunday, at least. Next week's forecast after my return from the Kumaon Himalayas, where I will be camping till Sunday. Next blog posting earliest on sunday, 30th. May. Increasing heat in U.K. In detail account of it on Mark's blog. "High pressure dynamics which is allowing a possible 30C high for London and south tomorrow"